Who doesn’t want to just dive into a big bowl of hot soup on a cold, blustery day? 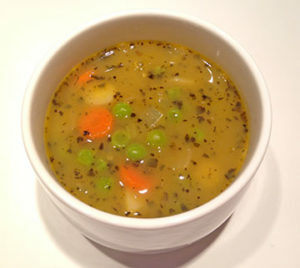 This recipe is dedicated to my husband, who loves peas in any form. I’ve got multiple versions below. First, the easy-peasy way (or should I say easy peas-y??? )…and then for people like me—who don’t really like peas but still want to eat them because peas are so healthy. With only 5 ingredients, this soup couldn’t be easier. The only real prep is chopping the onions, but you could even buy frozen chopped onions to speed that along, too. 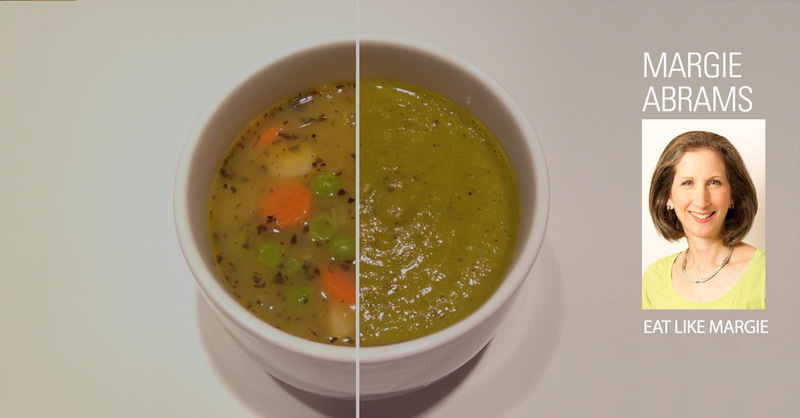 You could be enjoying fresh, hot soup in just 15 minutes! Warm up saucepan on medium heat. Add oil, and swirl to coat bottom of the pan. Add onions, and sauté about one to two minutes. Add broth and peas, and bring to a boil. Lower heat, and let simmer about 10 minutes. Purée with an immersion blender or in a regular blender until smooth. Tip: Leave out the stock, and you’ll have a tasty side dish! Just prepare the peas according to package directions (I microwave), sauté the onion and mix into the peas along with the basil. Or leave out the onion, and just flavor the peas with basil. This version has a lot more vegetables that fuse together into a veggie mélange where no one vegetable dominates the palette. The splash of wine adds a nice note in the flavor chord. 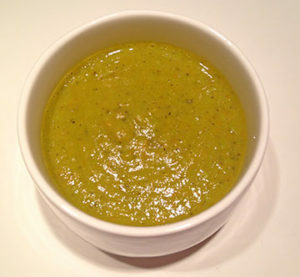 You can serve this pureed or as a chunky vegetable soup. No matter what, it’s tasty—and still fast and easy to make. Add onions and sauté about one minute. Add broth, white wine, carrots, parsnip and peas, and bring to a boil. Lower heat, and let simmer about 10 minutes, until the carrots and parsnip are soft. Purée with an immersion blender or in a regular blender until smooth—or leave it to serve chunky. 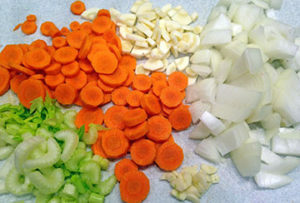 Or do a combo, where you puree some for a thicker liquid, but not all so there are veggies you still recognize.